This fast and easy 4.8kW system employs Enphase 6th generation IQ6PLUS microinverter technology with Canadian Solar 72 cell 345W panels to simplify design and installation. 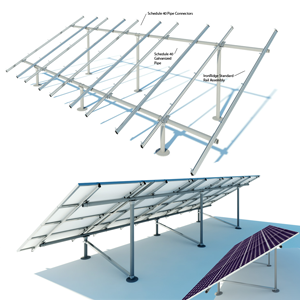 Independent minded customers are the inspiration behind our solar kits which provide quick and easy installation. Choose the Enphase kit that best fits your available space and budget with the knowledge you can expand your kit at any time down the road. Oh yeah we almost forgot, we supply a custom panel to meter NEC code compliant electrical line drawing for each solar package we sell where we will size the wire and show you how to connect the system. 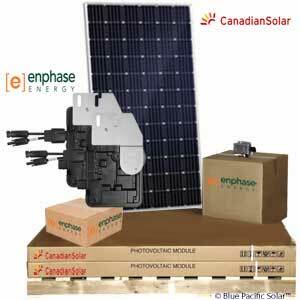 Enphase IQ6PLUS Microinverter 4.8kW Canadian Solar Energy Kit is relatively simple to layout and install. 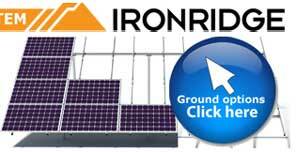 Blue Pacific Solar has provided all of the main parts you will need for your grid tie package. Here are some additional items that your may need prior to installing your system. Conduit, appropriately sized electrical wire, junction box at the array and with some multiple string systems an AC load center, some fasteners and grounding rod and wire. Building and installing your own home solar system is not only the smart choice for controlling your expenses, it may be on the most satisfying DIY projects you ever have undertaken. NOTE IMPORTANT INSTALLATION: It is the responsibility of the purchaser to ensure that all products are installed and operated in accordance with local and national building codes as specific by the NEC (National Electric Code), UBC (Uniform Building Code) or IBC (International Building Code) and local utility company policy. 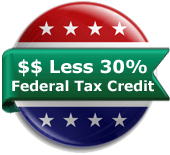 These codes may vary from city to city and county to county. 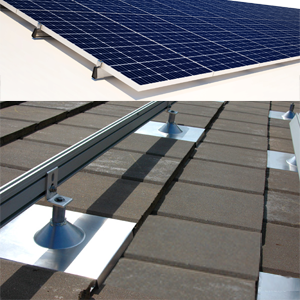 All Grid-tied solar installations should be permitted and inspected, where required, by the local inspection authority in the same manner as other equivalent electrical systems. It is always a good idea to contract with a local licensed electrician to at least do the final electrical connection of your Canadian Solar Enphase 4830W Solar Kit from the AC disconnect to your home utility breaker box. Some local permitting authorities require that a licensed electrician do all the wiring from the rack to the utility interconnect. Additional Safety Instructions; Perform all electrical installations in accordance with all applicable local electrical codes and the National Electrical Code (NEC), ANSI/NFPA 70. 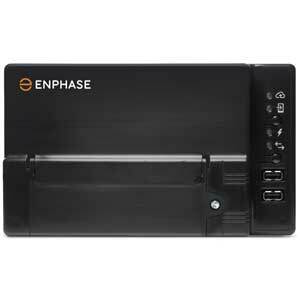 Be aware that only qualified personnel should install or replace Enphase MicroInverter. Do not attempt to repair the Enphase MicroInverter as it contains no user-serviceable parts. If it fails, please contact Enphase customer service to obtain an RMA (return merchandise authorization) number and start the replacement process. 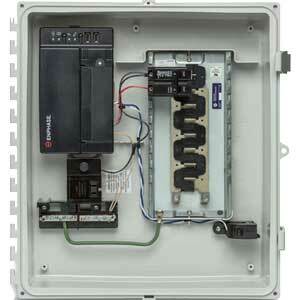 Tampering with or opening the Enphase MicroInverter will void the warranty. Before installing or using the Canadian Solar Enphase 4830W Solar Kit please read all instructions and cautionary markings in the technical description. Connect the Microinverter to the utility grid only after receiving prior approval from the electrical utility company. Be aware that the body of the microinverter is the heat sink. 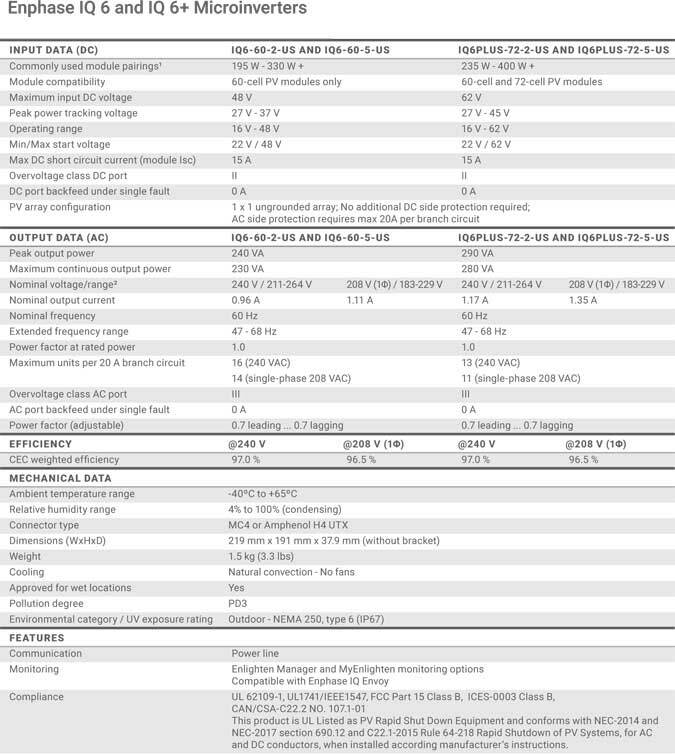 Under normal operating conditions, the temperature is 15°C above ambient, but under extreme conditions the microinverter can reach a temperature of 80°C. To reduce risk of burns, use caution when working with microinverter. Do NOT disconnect the solar panel from the Enphase Energy IQ6PLUS-72-2-US without first removing AC power. This Enphase IQ6PLUS Microinverter 4.8kW Canadian Solar Energy Kit is an affordable expandable do-it-yourself (DIY) high quality solution for your home or businesses energy independence.